The latest screenplay and directorial debut from Nicholas Jarecki (The Informers) is another look at the upper class, this time focusing specifically on hedge fund mogul Robert Miller (Richard Gere). Mr. Miller appears to be an exemplary, honest citizen with a wife (Susan Sarandon) and daughter (Brooke Miller) working in his company. However, it turns out that he leads a double life involving a mistress (Laetita Casta) whose art show he secretly funds. When an unforeseen accident happens, Mr. Miller must quickly cover his traces and call upon the only person he knows he can trust, a young black man (Nate Parker) who lives in a rough neighborhood. As the story progresses, their connection to one another comes into focus while a hotshot police detective (Tim Roth) investigates the events and attempts to uncover the truth by whatever means necessary. While critics are calling Richard Gere’s performance the best of his career, it’s not much of a feat considering the movies he’s been in. In my opinion, the real standout performance of the film is Nate Parker, who is quickly becoming quite a star, having just landed a role in the Oldboy remake. The conflict his character faces is complex and calls you to question how you would react in a similar situation. Indie darling Brit Marling, finally acting in a movie she hasn’t written, proves she can act even when she’s not involved in the screenwriting process. Nicholas Jarecki may have just excused himself from the awful adaptation of Bret Easton Ellis’ novel The Informers which he is credited as writing. Supposedly he and Ellis wrote the script thinking he would direct, but when the studio hired another director and the writer’s strike prevented further changes to the script, the movie ended up a colossal failure. With Arbitrage, Jarecki shows he has a firm grasp of the genre and knows how to poke fun at his characters without shrouding his film in satire. Although there’s nothing particularly wrong with the film, it doesn’t really stand out amongst this fall’s future Oscar contenders. 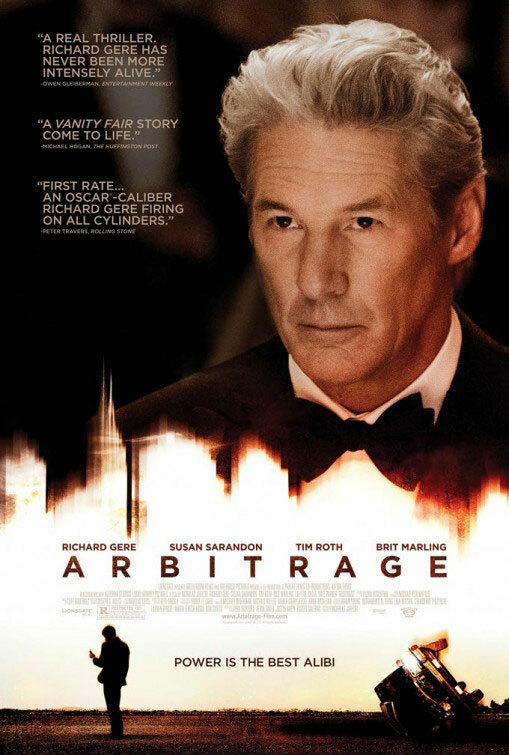 Arbitrage opens in Philly area theaters this weekend.